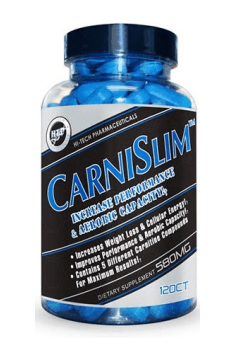 Hi-Tech CarniSlim is a supplement with a complex of ingredients, including five forms of carnitine, niacin, vitamin B6 and epigallocatechin gallate. The formula promotes weight loss by supporting processes of intracellular respiration and helps the body combat free radicals. L-carnitine is a compound involved directly in cellular energy metabolism. By binding to fatty acids, it functions as their transporter, thereby facilitating their oxidation and ATP synthesis. A couple of carnitine forms are aimed at, among others, maximising lipolysis in which this compound participates. Niacin is one of the vitamins which is a precursor to coenzymes participating in intracellular respiration without which energy production is impossible. Vitamin B6 is involved in many key reactions for the body, facilitates the formation of neurotransmitters, heme (haemoglobin component) and helps control reactions of carbohydrate and lipid metabolism. Pyridoxine chloride is one of the forms of vitamin B6 which has biological functions. Epigallocatechin gallate is naturally synthesised by plants. From a chemical point of view, it belongs to polyphenols and serves as an antioxidant, potentailly preventing the growth of cancer cells. L-carnitine is a compound found naturally in our body which is synthesised from the amino acid lysine and methionine in the liver, kidneys and brain. What is more, oral delivery is effective because this compound is absorbed in the small intestine. It is transported into enterocytes with sodium ions with the aid of OCTN2. Subsequently, when it reaches the bloodstream, it gets into various tissues. The exception is erythrocytes which do not have mitochondria and thus carry out anaerobic metabolism. The metabolites of L-carnitine are mainly excreted through the urine. Its cellulipetal transport is stimulated by insulin. Adipose tissue is composed largely of glycerol esters, so-called triglycerides, which include (apart from glycerol) long-chain fatty acids. Their combustion is possible only in the presence of oxygen and such reactions in the cell take place in the structure called mitochondrion, also referred to as the “powerhouse” of the cell. It is a place where the formation of ATP takes place, which is a carrier of biologically usable energy. Owing to ATP, metabolically active cells (e.g. neurons or skeletal muscles) may serve its function. These powerhouses have special protection because they are surrounded by two membranes which help separate processes inside the cell cytoplasm from the ones in the mitochondria. Many compounds are capable of penetrating the external membrane. However, long-chain fatty acids need a special transporter to get into the cell. This role is served thus by l-carnitine. Owing to enzymatic reactions, it is possible to transfer long-chain acyl groups to the mitochondrial matrix where they undergo combustion reactions, resulting in the productioon of ATP, water, carbon dioxide and heat. It can be said that l-carnitine is one of the “bridges” which facilitates close integration of adipose tissue (or fats transported from the liver which got here after absorption from the digestive tract) with tissues that need a large supply of energy, whose production will not be possible without a transporter. Niacin, otherwise called vitamin B3, can be synthesised in the body from the amino acid tryptophan. Nonetheless, this source is not able to meet its daily requirement and that is why it is necessary to provide it from the outside. This compound is very vital in the synthesis of coenzymes NAD+ involved in the combustion of high-energy compounds in the mitochondria (glucose, fatty acids), facilitating energy production. Without niacin, these organelles are like “a boiler-house without fuel”. Vitamin B6 is most often referred to as pirydoxal phosphate, but it takes also the form of pirydoxal phosphate and pyridoxamine phosphate. In terms of biochemical reactions in the body, it is a compound with many functions. It is involved, among others, in the metabolism of amino acids from which the body obtains neurotransmitters (serotonin, dopamine, GABA), mediators (histamine) or the already mentioned niacin. In addition, this vitamin has also been observed to take part in metabolic processes of carbohydrates (glycogen breakdown) and fats (synthesis of sphingolipids important for the nervous system). What is more, normal synthesis of heme – a component of haemoglobin which provides oxygen for tissues – is not possible without pyridoxine. Epigallocatechin gallate is a polyphenol occuring naturally in black and green tea. It has been demonstrated that it has antioxidant properties and thus prevents the cell damage caused by oxygen radicals formed during processes of intracellular oxidation. In comparison with other compounds, it has been proven to inhibit most significantly the cycle of cancer cells at the G1 phase, thereby inducing their apoptosis. It shows a great potential for treating cancer in the future. To sum up, Hi-Tech CarniSlim is a dietary supplement designed for physically active persons who want to take care of their health by enriching their diet with vitamins and antioxidants. It is recommended especially to individuals who wish to lose excess weight because carnitine affects fat metabolism. As a dietary supplement, take 2 tablets, 2 times daily, 8-12 hours apart. Do not exceed 4 tablets daily. The supplement is suggested mainly for persons who struggle with excess body fat and want to improve their figure and take care of their health by providing vitamins, which take part in energy processes and synthesis of other biologically important substances. From personal experience, in order for the lipolytic effect to be noticeable, I recommend to follow a diet with a negative calorie balance. This will help release fatty acids from adipocytes and “recycle” them in the mitochondria of metabolically active cells. A good idea will be the supplementation with 200-400 mg of caffeine in the morning or before and after a workout. Dicalcium Phosphate, Silica, Microcrystalline Cellulose, Vegetable Stearic Acid, Titanium Dioxide, Vegetable Magnesium Stearate.